South America….magic realism… real magic – it’s been in my blood since I’ve been born. Back in 2000, I had the glorious good fortune to travel to Ecuador and be immersed in the Cotopaxi tribe’s culture in the Andean Highlands for a short, yet timeless time… We merged with Pachamama, sacred feminine presence of the earth, visited the sacred sites of the culture; the agua sagrado, hot springs at 14,000 feet elevation, the Pasachoa Cloud Forest, Cotopaxi National Park – flush with wild horses, smoking volcanoes … and communicating with frogs … We connected with Mama Killia (the moon) and Inti (the sun.) We even had the amazing experience of cooking classes learning indigenous cuisine. What a gift! I’ve posted once, so far, about this unique, unforgettable time. Check out one favorite recipe here – Potatoes – Tomatoes; and an authentic Ecuadorian recipe from the Andean Highlands. Recently, I’ve discovered a South American snack for sale commonly in markets I visit here in northern Colorado – imported from Lima, Peru; these little fried plantain chips transport me back to that magic time. Inka Chips. Today, I created a very simple avocado dip reminiscent of common ingredients often used together from my trip to Ecuador. Spicy and herby, with the creamy richness of avocado, it is absolutely delicious. By hand: mince herbs and then thoroughly stir all ingredients together. By food processor: process everything until completely yet coarsely blended. Mash avocado with a tablespoon or more of spicy herb paste – to taste. 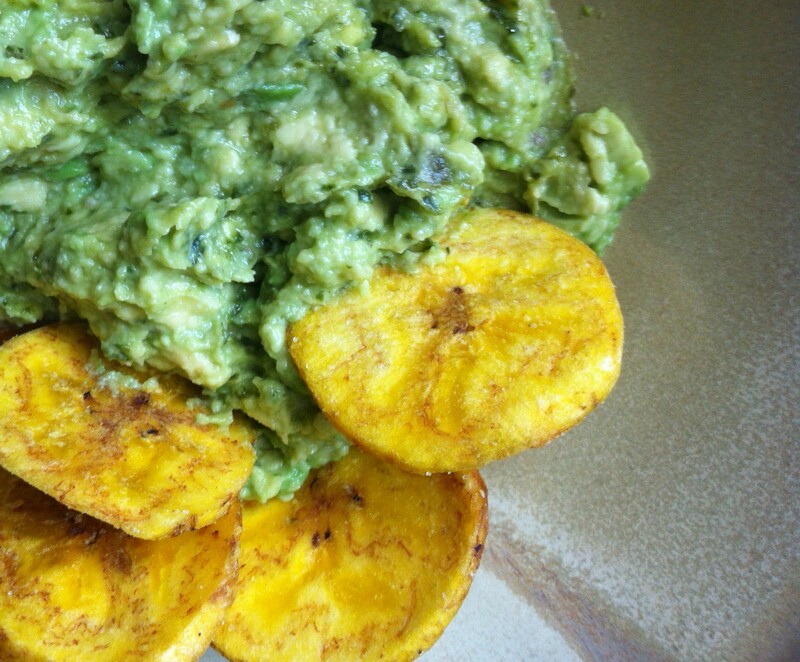 Serve with plantain chips, tortilla chips, warmed tortillas or vegetables. Makes a fantastic topping for scrambled eggs or an omelette, a spread for sandwiches, or whatever your heart desires. Looks delicious. I also love plantain and (when I can find it in the store) like to slice it, then fry it in coconut oil until crispy and golden brown. It always reminds me of my time in the Caribbean. 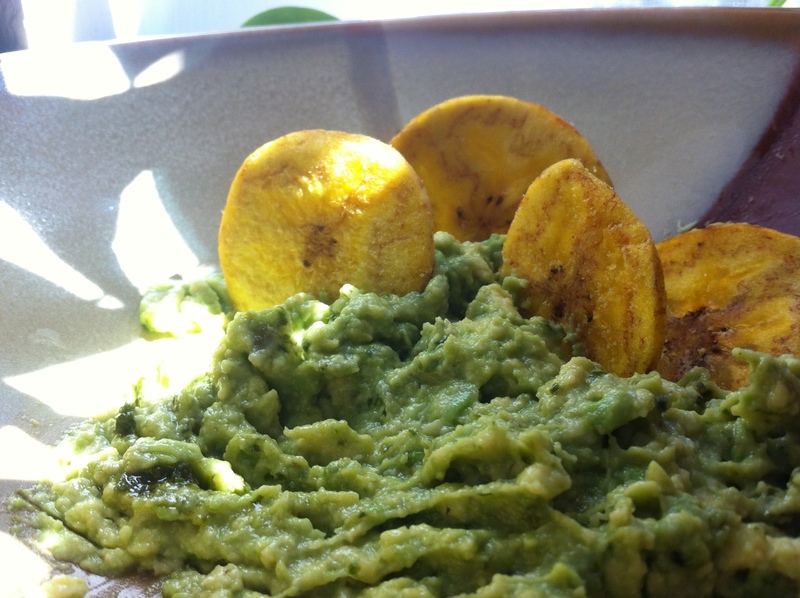 I am going to have to try making these plantain chips… and whipping up a batch of this dip! Gosh, my mouth is watering just thinking about it! A natural response! I’m up with the beautiful red lunar eclipse, wishing I had some left for snacks!